Is Fernando Alonso About To Announce He's Ditching F1 For IndyCar? What is Fernando Alonso going to do next year? It’s the question on the lips of not just F1 fans, but also motorsport fans. It’s hard to imagine him committing to another year of F1 given that McLaren doesn’t look like being a championship contender any time soon, and he himself shot down the already ridiculous rumours that he might go to Red Bull. Will he stay in F1? Will he go and do IndyCar? Or will he something else entirely? It seems we might not have to wait too much longer to find out - if this tweet and accompanying countdown gif is anything to go by. It seems like something is happening and the mere anticipation sent fans into a frenzy. @IndyCar knows something we’ve being hoping for, don’t you? Please don't tease me like this. 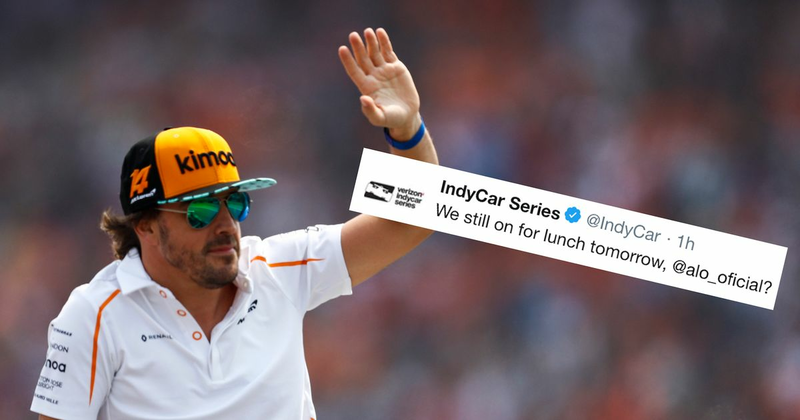 Is Fernando about to announce that he’s leaving F1 to do a full IndyCar season in 2019? It would make sense. He’s already won two legs of the triple crown, which surely makes having a full assault on IndyCar and the Indy 500 even more appealing. Also, if he continues in F1, he’ll either have to miss the Australian Grand Prix or the Sebring round of the WEC. If he skipped the WEC race that would almost certainly cost him the championship. If he skipped the Australian GP and the McLaren turned out to be an absolute belter, it would potentially hurt his championship chances in F1. On top of that, IndyCar team boss Michael Andretti recently said that although he’d love to have Alonso drive for him, the decision had to be made by 19 August. Whatever this announcement is, it certainly fits within that timescale. Yeah, it’ll probably be about Kimoa. That or his karting school. Either way, we haven’t got to wait long to find out.